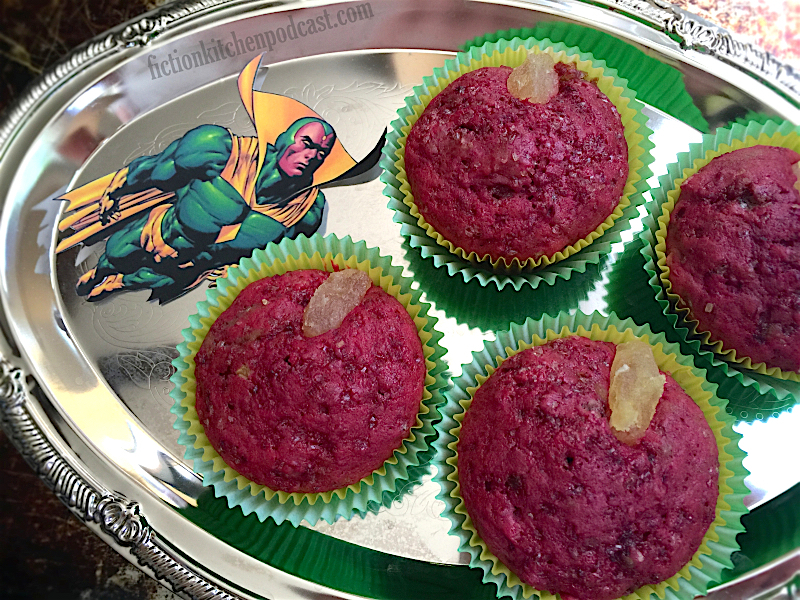 Vision is totally my favorite character in "Avengers: Age of Ultron", and for some reason muffins are what immediately came to mind when I was brainstorming food ideas. I have no idea why. And to get that beautiful magenta/deep pink color of Vision's face, there is no other ingredient better than a beet. Also, pineapple infinity stone, anyone? :) The recipe below was adapted from a recipe on Journal Sentinel. *To make the beet puree, preheat your oven to 375ºF & wash & pat dry the beet. Wrap in foil & place on the middle oven rack. Bake for about 60 minutes, or until a knife can easily pierce it. Unwrap it (careful! It's hot!) & then let it cool completely. Rub/peel off the skin & cut it into small chunks, & then puree well in a food processor. In a large bowl, whisk together the puree, butter, egg, sugar, buttermilk, vanilla, & optional orange juice concentrate. In a separate bowl, whisk together the flour, baking powder, baking soda, & salt. Next, stir the dry into the wet just until combined. 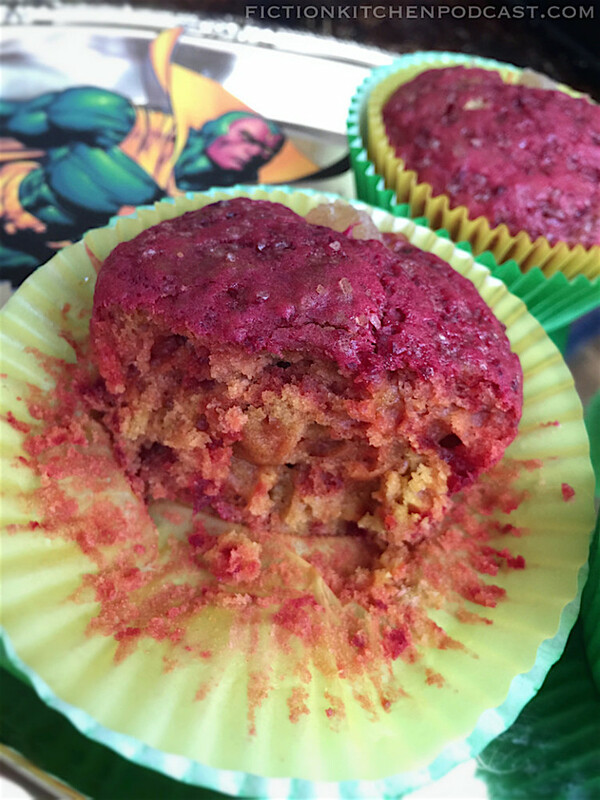 Line a muffin pan with baking cups (preferably yellow) & fill the cups about 2/3 full with batter. Sprinkle the tops lightly with turbinado/raw sugar. Using your fingers, squish & reshape 12 pineapple tidbits into a sort of rounded diamond/pointed oval & place 1 each at the top edge of the unbaked muffins. Slide the pan into the oven, middle rack, & bake for about 20 minutes, or until a toothpick inserted into the center of a muffin comes out clean. Remove the muffins from the pan & let cool on a cooling rack. To continue The Vision's color scheme, drop the muffins into green baking cups (to me, green on the outside & yellow on the inside looks more appealing than vise-versa).